At Curtain-Tracks.com, we want to make your (curtain-hanging) life easy. Our site is packed full of all kinds of drapery hardware, accessories, and doo dads that, together, can solve every curtain-hanging dilemma ever encountered. We know what you’re thinking, “there’s no way they have something that will make it easy to put up a valence.” (Ok, maybe that wasn’t exactly what you were thinking.) As it turns out, we have a flexible track valence-hanging kit that makes it very easy to install a valence onto our 6100 Flexible Curtain Track, because it has everything you need in one place! Our Flexible Curtain Track is one of our best-selling tracks, and with good reason. It is an inexpensive, high quality, white PVC track with an internal metal spine that can be bent by hand for curved applications. This track can be mounted on the ceiling or the wall. Installation of a valence with this track is accomplished by attaching the valence clip to the ceiling cartridge or wall bracket, then clipping in the valence board. Next use the Velcro cloth and tape to secure the valence fabric to the board, and don’t forget the end caps! All these pieces of drapery hardware are included in the assembly kit and are enough for a 10-foot section of valence. If you think only grandmas hang valences, think again. They have modern practical and decorative purpose. Practically, a valence will hide your track and drapery hardware. Decoratively, a valence ties the curtain panels together into one design element even when they are open, and especially on large windows. A valence gives a window a tailored, finished look. Using a valence makes it look like you put a lot of time and thought into your window treatments (whether you really did or not). 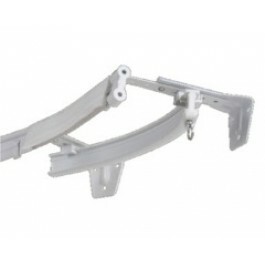 We are very fond of putting compatible tracks and drapery hardware together in easy-to-use kits: check out our ceiling mount curtain track kit, and shower curtain kit. Have a question? Give us a call at 888-434-7444 and we will be happy to assist you.